Above all, Mydax specializes in custom refrigerated chiller products. 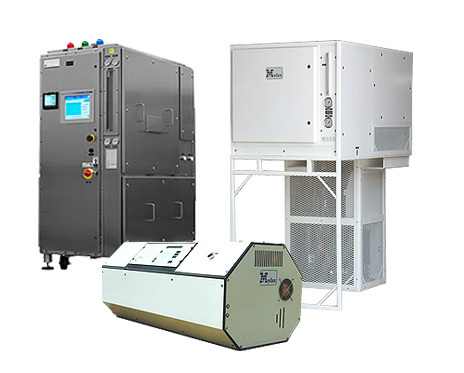 We have our liquid chiller system designs in everything from Navy submarines to Air Force cooling carts, Semiconductor process equipment, FCEV Hydrogen Refeuling Stations and Bio-Pharmaceutical OEM process control systems. Mydax’s patented precision “Advanced Temperature Control Technology” allows for full proportional cooling from 0 to 100% load. Mydax can design any shape to fit around your equipment, pump selections to meet all your needs, air-cooled, water-cooled, multiple cooling loops — Mydax can do it all! Special interface requirements, digital or analog, pump output heat transfer fluid flow and pressure control, temperature cycling and ramping all available. Mydax Low Temperature Custom Chiller system with parallel compressors rated at 12,900 Watts of cooling at -45°C with 25 GPM @ 20 PSI Dow Syltherm HF Silicone Oil. This Water Cooled Chiller is seen in an early stage of QA Test. Mydax Custom Liquid Chiller system with 3 independent temperature controlled loops. Outdoor Rated Water Cooled Chiller system rated at 8,000 Watts of cooling at 20°C in each loop simultaneously with each loop supplying 6 GPM @ 140 PSI of PAO oil.